How many of us are aware of the GST on flight tariffs? It is human nature to care less about the fragmentation of tariff when it’s affordable until it brings a drastic change in the prices. The truth is airways is the most expensive mode of transport in India and the passenger traffic in this sector is growing every year. This increase in the number of air travelers shows that more and more Indians are taking flights over other transport modes to save time. So let’s talk about GST for flight tariffs!!! Indian aviation sector is the third largest domestic civil aviation market in the world which means this sector contributes a large amount in paying tax to the government. The impact of high tax reflects on the flight tariff making the air traveling costs to rise. Goods and services tax was an initiative by the Indian government to combine all the segmented taxes under a single tax rate. Under the new taxation, the tax on the economy class is 5% while business class is 12%. The percentage may not make a huge difference at the consumer level now though it surely will affect the aviation industry in the long run. The frequent air travelers may have noticed the change due to GST on their flight tariffs. Most of the seats on the plane are for economy class. The airlines draw the highest revenue from the passengers traveling in economy class. Therefore, awareness of the GST on tariff needs the most by economy class travelers. 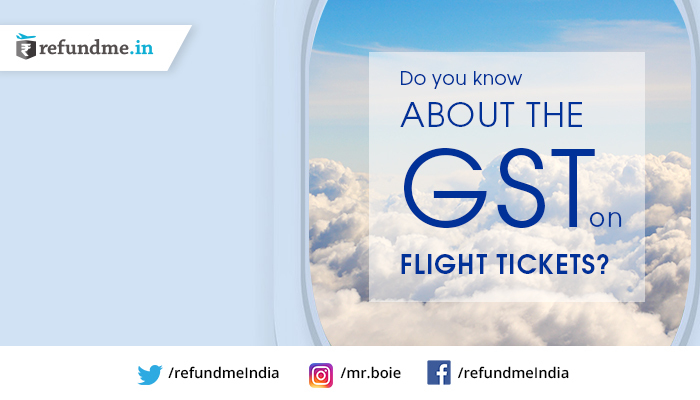 refundme.in , the first ever flight compensation service provider and the protector of air passenger rights feels every air traveller should be aware of the different segments comprising the flight tariff one of which is GST. This will allow air passengers to understand the flight fares better and refundme.in will be more precisely able to help the air passengers with flight cancellation and denied boarding issues.